Floor mats are split into two broad categories. There are residential mats that are used by homeowners for various applications in a residential setting. We also have commercial floor mats that are designed for installation in businesses, commercial, industrial, factory, and any other production environment. 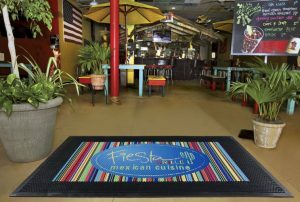 Commercial matting solutions are usually classified as either general-purpose floor mats or specialty floor mats. General-purpose or all-purpose floor mats are designed for installation in any commercial environment and they provide basic functionality in any setting. On the other hand, specialty floor mats are meant for application in special commercial or industrial settings to provide specific functional benefits. We will look at both general and specialty commercial matting solutions for business and industrial application below. Anti slip or slip resistant floor mats are installed on wet slippery floors and surfaces to protect workers and customers from suffering accidental falls. These are general-purpose commercial mats that are suitable for installation in any industrial or business site. They feature ridges and/or textured surfaces for gripping the floor and for providing traction to human traffic and in some cases to production vehicles. Anti slip floor mats are also used for scraping dirt and other debris from users’ shoes, which means that they also ensure cleanliness in the workplace. Just like the anti slip floor mats discussed above, anti fatigue floor mats are general-purpose or all-purpose floor mats that can be installed in any workplace. However, anti fatigue floor mats are a bit different than their slip resistant counterparts in that they are mainly installed in areas that involve users standing for too long. Anti fatigue matting solutions provide ergonomic benefits to users by relieving joint and muscle staring during long standing working hours. They are constructed with a cushiony form material for buoyancy. They offer workplace comfort thereby promotion the health and wellbeing of the workforce, which translates into increased productivity for the firm. Heated mats fall under this category of floor mats because they also provide comfort in the workplace by providing warmth to workers during chilly weather conditions. As mentioned above, all commercial matting solutions can be classified as either general purpose or specialty floor mats. Specialty floor mats vary in application and intended sites of installation. We have noise and vibration reduction floor mats, which are designed for installation in active commercial settings such as gyms and mines. There are also electrostatic dissipative (ESD) and conductive matting solutions for installation in production environments that use electricity, such as welding sites and manufacturing factories. And in medical matting, we have antimicrobial floor mats to ensure that healthcare facilities remain clean, sterile and uncontaminated. Other specialty commercial matting products provide proofing safety. These include waterproof floor mats, chemical resistant mats, grease and oil resistant matting solutions, stain resistant mats and so on. Logo mats are specially designed floor mats that are chiefly installed for advertisement and promotional purposes in commercial settings. Logo mats usually feature the logo of a company and maybe a short catchy and alluring message on their topside. These graphics are supposed to impress customers who are visiting the company’s premises thereby serving to promote the company name and to enhance brand recognition and appreciation.